Electricity network charging is facing its most significant reforms since the creation of the current NETA/BETTA system. Ofgem believes that current charging methodology creates distortions in the market and incentivises undesirable behaviours. This is because the entire electricity network structure is undergoing significant change, from a highly centralised system dominated by large units of generation connected to the high-voltage transmission system, to a more de-centralised, distributed system, with a significant amount of generating capacity connected to the lower voltage local distribution networks. In order to ensure that users of the transmission and distribution networks are charged fairly for the costs they impose on the system, Ofgem is pursuing a number of avenues of reform to remove distortions that have arisen as an unintended consequence of recent market change. 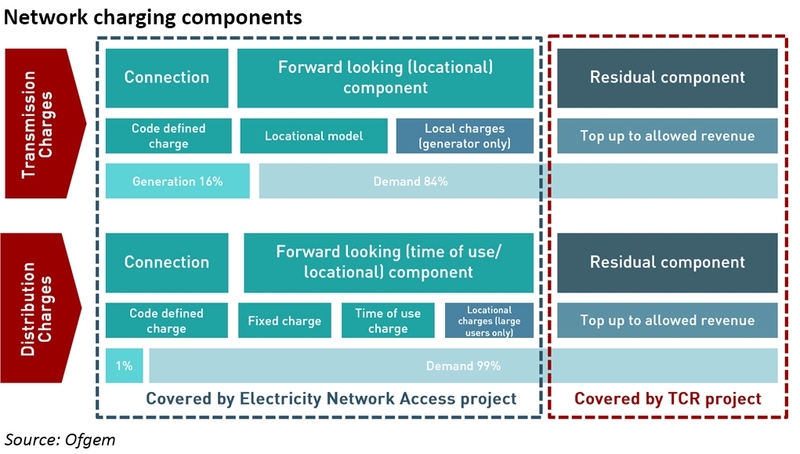 There are two main initiatives underway, the Targeted Charging Review (“TCR”) of residual network charges and embedded benefits, and the market access and forward-looking charges review taking place as part of the Electricity Networks Access project for which a Significant Code Review (“SCR”) was launched in December. At the same time, National Grid and Elexon are both consulting on specific code changes that support Ofgem’s objectives. Ofgem intends to implement the reforms arising from the TCR in 2020/21 and anticipates any changes from the SCR to take effect over 2022/23. This means that market participants face significant change over the next few years, in addition to changes already implemented, with the potential for major impacts on investment outcomes. This blog explores the key areas of change businesses may see in relation to network access and charging, and describes some of the key policy levers available to Ofgem in determining the charging and access arrangements of the future. Residual charges: designed to ensure that network costs not recovered from the forward-looking charges are fully recovered. Safeguards that recognise electricity as an essential service, taking account of the needs of vulnerable consumers. a focused review of transmission network charges (Transmission Network Use of System (“TNUoS”) charges). The transmission connection charging boundary. Introducing greater granularity for low and high voltage distribution networks soDUoS charges are more reflective of actual local network conditions. Building comprehensive network models may be difficult at lower voltages so dividing the distribution system into generation or demand dominated zones may be preferred. This could mean embedded generators in generation-dominated areas could pay a charge rather than receive a credit, while demand could receive a credit. The methodology for extra-high voltages could move to a zonal approach, or be aligned with the approach used for TNUoS forward-looking charging. The balance between usage-based charges, including time-of-use charges, and capacity-based charges should be considered, to better reflect the costs or benefits of a user’s access choices. The existing connection boundary sends a locational signal to new users about the most efficient location to connect, however the potential high upfront cost of connection may act as a deterrent. Moving to a shallower connection charging boundary could reduce these barriers to entry, as new connections would no longer principally bear the costs of any reinforcement. However, reducing connection charges in this way would only work if better locational signals were sent through ongoing DUoS charges, incentivising users to provide flexibility to offset the need for reinforcement. A more focused review of forward-looking TNUoS charges. to prevent incentives to reduce output during peaks, a “floor at zero” means they don’t pay TNUoS charges when they are adding to transmission network flows (and hence costs). Aligning the charging structures for small embedded generators with those of larger generators would ensure all generators receive the same transmission forward-looking charges. They would receive TNUoS credits in zones where they are expected to reduce long term transmission costs, and pay TNUoS charges in zones where they are expected to increase long term costs. Under Fixed Charges, the domestic segment contribution to residual charges would reduce, while the other segments would see moderate increases, as large users will see charges changing from a peak capacity basis to a volume-based fixed charge basis. Under Agreed Capacity Charging, domestic users would also see their share of overall charges fall, but by a smaller amount than for Fixed Charging. Larger users would see their contributions fall they hold relatively small amounts of agreed capacity. The bulk of the charges would be faced by low-voltage non-domestic users. All final demand users should pay fixed charges for the voltage level at which they are connected and those above (higher voltage levels). Distribution fixed charges shall be set separately for each DNO, in order to account for the different residual charge requirements that follow from separate allowed revenues and forward-looking charges revenues. Fixed charge segments for recovering distribution residual revenues shall be set separately for a number of segments. The extra high voltage levels should form a single segment. For the high voltage and low voltage voltage levels (ie for CDCM customers), LLFCs shall be used to further segment these customers. A single charge be produced for extra high voltage users. A single charge should then be produced for each of the LLFCs. For each DNO, the proportion of charge allocated to each LLFC or to the extra high voltage level should be based on that segments overall contribution to net volumes on that distribution network. Fixed charge segments for recovering transmission residual revenues shall be set separately for a number of segments. The extra high voltage levels should form a single segment, and the transmission voltage level another. For the high voltage and low voltage levels (ie for CDCM customers), Line Loss Factor Class (LLFCs) shall be used to further segment these customers. A single charge be produced for extra high voltage users, and a single charge should group all transmission connected users. A single charge should then be produced for each segment defined by the LLFCs. The residual charge for each segment is determined by the proportion of the volume that segment consumes as a proportion of total consumption. The proportion of charge allocated to each LLFC or to the extra high voltage or transmission voltage levels should be based on that segments overall contribution to net volumes on the transmission networks. Transmission Generation Residual payments: smaller embedded generation is not subject to transmission generation residual payments, which are currently negative. A negative TGR directly increases costs for consumers, as it results in an increased Transmission Demand Residual paid by consumers. It also makes transmission-connected generators more competitive relative to other generators, for example in the Capacity Market where this additional revenue can distort bids, making this generator more likely to clear in the auction, at the expense of capacity which is actually more cost-effective. BSUoS charges – payments: smaller embedded generators can generate income by helping suppliers reduce their contribution system balancing costs. Suppliers pass on most of these savings to smaller embedded generators through contractual arrangements and then recover the cost of these payments from other customers, meaning the payments directly increase costs to consumers. BSUoS charges – avoided charges: smaller embedded generators also avoid paying generation BSUoS charges, which all other generators connected to transmission and distribution networks are required to pay. Larger generators therefore pay higher balancing charges, which may be passed on the consumers through higher wholesale electricity prices. Each of these Embedded Benefits represents a difference between the revenues or costs of small embedded generation and larger generation, which does not reflect a difference in the value provided or cost imposer on the system. Ofgem believes these distortions also lead to higher consumer costs as they result in inefficient investment in generation connected to either the transmission or distribution networks potentially requiring higher network costs. Ofgem has asked National Grid to set up a BSUoS charges task force to examine the potential for making some elements of BSUoS more cost-reflective and hence provide stronger forward-looking signals. This is due to report its findings in Spring 2019. Ofgem is therefore limiting its consideration to options which remove the BSUoS Embedded Benefits without changing the overall structure of these charges. TGR & partial BSUoS reform: Setting the TGR to zero and removing the ability of smaller embedded generators to receive payments from reducing suppliers’ contributions to BSUoS charges. TGR & full BSUoS reform: Setting the TGR to zero, removing the BSUoS payments, and requiring smaller embedded generators to pay BSUoS charges. Removal of the BSUoS Embedded Benefits would tend to reduce revenues and increase costs for smaller embedded generators, and reforming the TGR would reduce revenues for larger generators. Ofgem’s analysis shows that both options for reform have only modest impacts on system costs due to limited changes in the investment in generation capacity, and the operation of this capacity. Both options reduce consumer costs (by £4.5 – £6.0 billion for TGR & Full BSUoS reform, and by £3.3 – £4.1 billion for TGR & Partial BSUoS reform). These are partially offset by increases in Capacity Market clearing prices and payments to generators support by Contracts for Difference as generators in these markets would increase bids to offset the loss in revenue or increase in costs as a result of the reforms. The majority of the reduction in generator revenues would fall on existing renewables supported under the Renewables Obligation (“RO”). Larger RO-supported generation would see an increase in transmission charges, whereas smaller RO-supported generation would see the end of both elements of the BSUoS Embedded Benefit. The proposed reforms to the residual charges and the proposed reforms to the TGR Embedded Benefit would remove the differential treatment of on-site generation compared to other generation since no forms of generation would pay transmission generation residual charges and no forms of generation would receive payments/benefits from transmission demand charges. Non-exporting on-site generation would continue to receive benefits from helping to reduce demand BSUoS for the site on which it is located. Ofgem’s preferred approach is TGR & Full BSUoS reform, but it is consulting on both options, and will consider the findings of the BSUoS charges task force. It may well be the case that some current providers of flexibility do withdraw from the market, however, to date embedded generators have been able to benefit from income and cost reductions that are not commensurate with the benefit they bring to the system as a whole. The provision of flexibility becomes undersirable if its cost exceeds the network reinforcements it is intended to avoid, or if the flexibility is not required at that location. This could involve requiring small users to specify the level of capacity they require, with a minimum standard ‘core’ level and enabling them to choose from a range of options (eg varying in firmness or time of access) above this level. An alternative approach could involve placing a principles-based obligation on suppliers or another third party to determine the type of access that a small user needs for all their usage, requiring them to ensure they made that recommendation in line with a customer’s best interests. This could be tied in with the TCR and form the basis of any customer segmentation under the Agreed Capacity approach. Many households will have limited choice around their more essential needs, but some may have the ability to be flexible in their consumption eg in relation to EV charging. A core level of access could help ensure basic needs are met while protecting consumers from inappropriate access arrangements for these basic needs. Above this level, consumers could choose between continuous, higher level usage, or more flexible options such as off peak or interruptible access, with differential charging valuing these alternatives appropriately. Ofgem sees merit in developing options to improve the definition and choice of: firmness of access rights ie when access might be curtailed and whether payments will be available if it is; time-profiled access rights eg off-peak or seasonal access rather than year round; and short-term access rights. Ofgem is also seeking views on the value and feasibility of options for defined long-term access rights for a fixed multi-year duration, and local or shallow access rights such as access to only trade over the local network. Access rights could also be allocated through auctions rather than on a first-come-first-served basis which is currently the case, although Ofgem is not currently considering universal auctions for the initial allocation of access rights. The use of ‘targeted’ auctions for the initial allocation under certain situations (eg where significant queues exist), could help ensure those that value access most are able to obtain it and provide better signals to network operators about the need for new network capacity. However, better definition of access rights and a decision on the connection-charging boundary would be needed, before auctions could be designed, and as the development of targeted auctions is likely to be complex, Ofgem believes there will be benefits in considering this across both transmission and distribution together. For this reason, Ofgem is not proposing to make this a priority at this stage. Similarly, extending the benefits of the allocation approach under Connect and Manage to distribution networks would require the establishment of firm access rights at distribution which is unlikely to be achievable in the short term, due to the need to develop new network planning standards. Access rights could be defined to apply to the whole system, allowing access to the entire distribution and transmission system, and hence all GB markets, or they could be “local” to a specific geographical area or “shallow” to a specific voltage level. Ofgem believes that the development of local or shallow access rights could provide a useful signal about the benefits of matching generation and demand locally. However, development of local access rights could be very complex and the creation of local access rights may have the effect of splitting GB’s single market into multiple local markets. The use of forward-looking charges might provide an equivalent signal more simply, and Ofgem’s provisional view is that a charging-based approach is likely to be preferable. Overall, Ofgem’s view is that the stronger the emphasis on choice of access rights, the greater the case for capacity-based charges – charges that are based on the capacity requested by the users in kW rather than usage charges based on the volume of electricity consumed in kWh. Ofgem is also considering developing new access conditions such as “use it or lose it” or “use it or sell it” to increase the utilisation of the existing capacity by reducing capacity hoarding, and enabling holders of access rights to trade them with others, for example to reduce their curtailment. This would be similar to the approach taken for interconnectors. The changes that have been announced in Ofgem’s minded-to decision, and those that might arise from the SCR will fundamentally change the way in which users access and pay for the electricity system. Many users have deployed on-site generation to manage loads in order to minimise costs under time-of-use pricing; provide demand-reduction services to suppliers and earn BSUoS-related payments; and provide flexibility services to network operators. 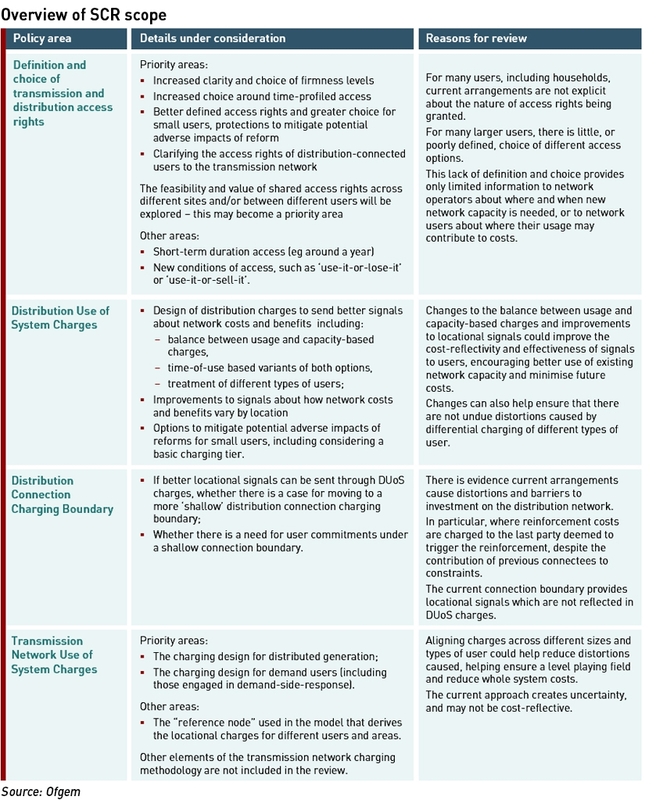 Under the package of network reforms under consideration, the income from provision of demand-reduction services to suppliers would disappear, and there would be higher costs in the form of: a new BSUoS charge; a higher contribution to demand residual charges under either of the proposed charging options, with no distinction between users with or without on-site generation or storage; and increased use of system charges with a new TNUoS contribution and local-based DUoS charging (although these could be credits if the site is in a demand-heavy region). Some market participants are concerned that these measures could deter the provision of flexibility to the system, but Ofgem believes that its proposals will be more cost-reflective than current arrangements, meaning that users pay network charges that better reflect the costs they impose on the system. While some providers of flexibility may see their costs rise – and willingness to provide flexibility fall – the changes will still be beneficial at the system level if overall costs are reduced. Potential to earn credits in relation to use of system charges if the site is in a demand-dominated region (although many businesses will lack location flexibility so may not be able to benefit other than by chance). Establishing a genuinely cost-reflective charging framework is not straightforward, and inevitably some distortions will remain (or new ones be introduced) – while Ofgem’s objectives are sensible this is a complex area which will have significant consequences for all electricity users. Against a backdrop of rising energy costs, understanding the impact of these changes on individual businesses will be key to developing robust business models and investment cases for new projects. ← As another project hits the rocks, what’s next for new nuclear in GB?